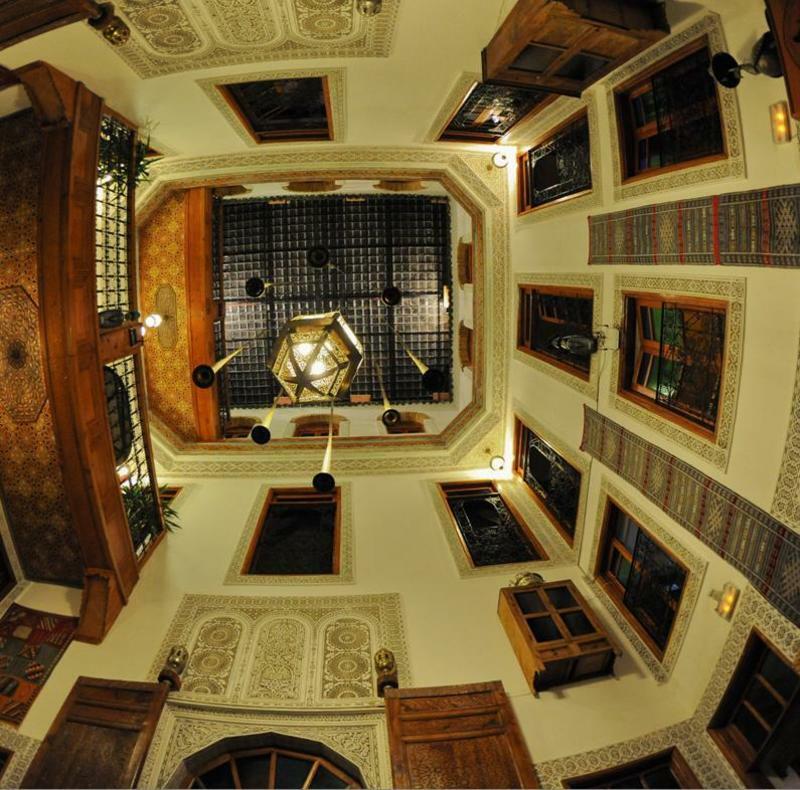 Top rated Hostel Riad to stay in Fes - ideal for the traveler who likes great prices, perfect location and wants to meet other like-minded souls at a fair price. HOT SHOWERS and HEATED ROOMS – no more feeling chilly in Fes! Excellent wifi – very fast download times. New room just opened up, awesome 5 person ensuite dorm room. Special promotional prices to be had. Christmas and NYE parties planned, BBQ dinners free for all our guests. We also serve alcohol, wood oven pizzas, delicious fresh Italian salads and Moroccan meals. Check out our deals, we offer one free night when you book 2 nights or more on line. Pending availability on arrival in same room type. In a great location with views over the whole Medina. 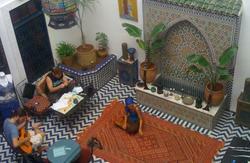 This is by far the best place to stay in Fes! In fact, we are Lonely Planet-recommended and the winner of a Top Hostel in Africa 2012 and 2013 award and winner of TripAdvisor Excellency 2013. With plenty of activities to choose from and daily cheap camel treks to the Sahara desert. You can do henna painting, basic Arabic classes, daily yoga sessions for girls, drum sessions and cooking lessons on demand, hammam trips and daily tours of the Old Medina. We also offer trips out of Fes to Volubilis, Meknes and Azrou to see the monkeys. The 5 person ensuite room is on the patio level and features heating, air conditioning, Wi-Fi, an iDock, satellite TV and a fridge. This level also has the four-person bunk bed dorm room with a shared bathroom next to the room, plus heating, air conditioning, Wi-Fi, an iDock, satellite TV and a fridge. On the mezzanine level is our budget twin ensuite room with an iDock, can be made into a double bed. On the first floor we have the budget single room featuring a shower room and sink plus satellite TV. Please note that this is an internal room. The lavatory is outside the room. The male bunk bed room has a bathroom outside the room, while the three-person ensuite dorm has an iDock, a fridge, a balcony and satellite TV. We have 2 double ensuite rooms featuring iDocks, fridges, a chill-out area, a balcony and satellite TV. These rooms can have a capacity of 4 people by using the sofa beds. Up on the second floor you will find a 6 person female dorm featuring iDocks, chill-out areas, balconies, satellite TV and fridges. The bathroom comprises 2 showers. Also ideal for 6 person mixed groups. Up on the terrace level is our renovated Berber 5 person dorm room, shower and toilet just outside the bedroom. We have a daily maid service, clean sheets and towels and blankets provided and laundry facilities. Our delicious breakfast is included in the price and is served from 9.30 am till 11.30. Taxes are not included, you will be charged in addition to your 90% pending on arrival. We accept Credit cards with a 5% fee, Cash in Dirhams, Euros, Paypal and Lloyds TSB banking and La Caixa banking if you want to pay online. Other facilities include a coffee shop, a restaurant, a juice and smoothie bar, free high-speed WiFi and you can use the communal PC. We even have a chill-out Berber tent on the terrace, a sheisha-smoking den and a VIP 360-degree panoramic viewing terrace to soak up the atmosphere. Drinks organized in the evenings. In the dorm rooms we have individual lockers and private rooms have safes. The hotel is very safe and we have security cameras. Please bring earplugs if you are a light sleeper as sound travels around this Riad, there is large interior open space and we do organise birthday parties, cake and wine free if its your birthday! This place is fun and relaxed and your hosts Leanora and Nour just want you to feel at home. Our clientele are normally young single travelers around 24 to 40 years of age. This hostel is not suitable for people over 40 or families with babies. Fes is a city where the locals love to haggle and hustle, be warned that if this is your first time to Morocco the experience can be quite overwhelming in the beginning. Just go with the flow and embrace the atmosphere! Please print these directions so you can find us easily. Be very careful of people on the trains, in bus stations or at squares who tell you that they are lawyers, doctors or live overseas and express a very keen interest in helping you out; there is usually an ulterior motive and they're con artists. If someone does guide you to the riad, show your reservation sheet and explain that you do not need a tour of the Medina the following day but do tip him for his trouble. Fes is notorious for its con artists so please do not believe these tricksters on arrival to our city. 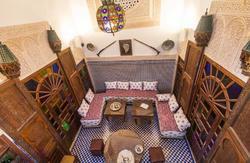 Hop in a taxi and ask for Riad Sheherazade, Batha in the Medina, close to the Batha Fountain. Do not get out of the taxi 'til you are sure you are at Riad Sheherazade. 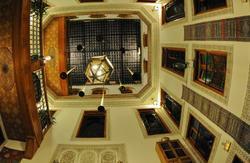 Looking at Riad Sheherazade, turn left and walk for 150 metres. We are down the street on the right - the first riad on the right, with bonsai and palm trees, lanterns, a brass door knocker reading 'Riad Verus' and a wooden porch. If you get lost just give us a call and we will come and search you out!! If you're arriving after 10pm it is likely the office is closed so the phone wont be answered; knock on the door and the guard will open up the door for you, We do have a live DJ most nights til midnight. You can get a bus from the new town but realistically you'd only save about 4 DHM so it's worth it to take a cheap red taxi - get them to turn on the metre though! we also have an uploaded directions video on youtube worth checking out.